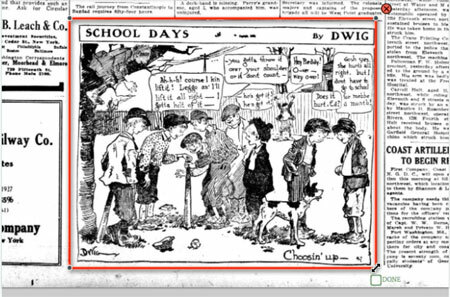 The Beyond Words project invites people of all ages to identify cartoons, illustrations, photographs, and maps from World War I historical newspaper coverage found in the Chronicling America historic newspaper collections. All data generated will be in the public domain and available to anyone. The three tasks include marking, transcribing, and verifying. Mark: Locate images not contained in advertisements on newspaper pages. Transcribe: Type the titles, captions, and cutlines of pictures marked by fellow volunteers and correct inaccurate OCR (optical character recognition) text or add missing details. Verify: Help ensure the accuracy of transcriptions to produce the highest quality data. What a fun literacy activity for students! And be sure to check out the gallery.